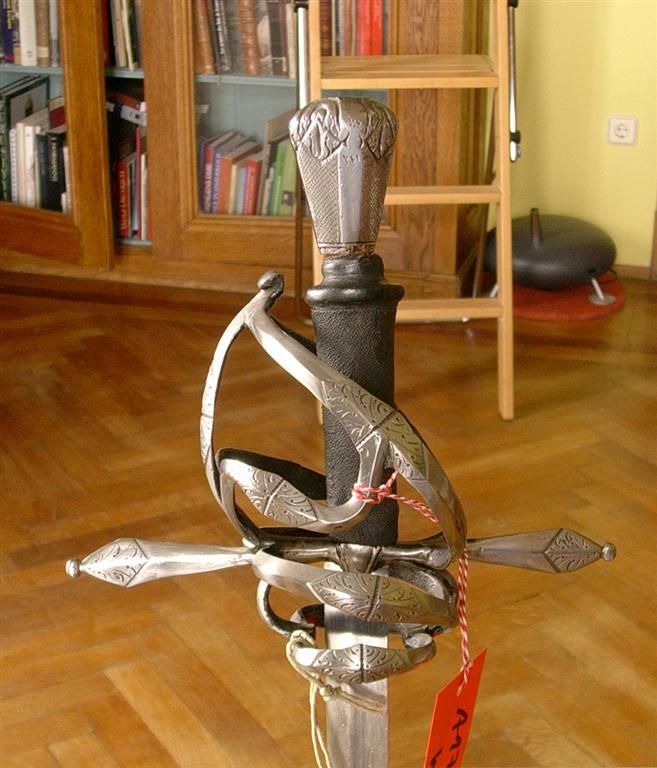 In December 2014 I placed an order with Marco Danelli for a complex hilted longsword adaptation. The sword was based upon an original hand-and-half riding sword and (apparently, as Nathan pointed out) a replica by Patrik Bárta. For pictures and stats I'll simply redirect to Marco's website as I couldn't possibly provide better pictures. As indicated on the site, the hilt was lengthened as per my wish, while the decision to consequently lengthen the blade by 5cm over the original was Marco's. Decorations that are present on originals of this hilt type were left out as it was intended from the start as a solid sparring piece. The sword arrived in August or September 2015, don't exactly remember when, and has since been greatly appreciated. The satin finish applied to the swords looks gorgeous and has been well executed throughout. All weld marks on the hilt had been completely polished off, leaving an almost seamless impression. While I am extremely fond of the finish the sword boasts, there was one major issue with the sword when it first arrived. The handle was not in line with the blade, being bent a few degrees to the side, enough so to disrupt its handling. This was fixed free of charge upon sending the sword in for repair. The very pommel is still slightly off-center, but that's something I am not bothered by at all. The handle is wood covered with surprisingly thick black leather that has been cord-bound to provide some texture. The sword is not peened but assembled with a nut on a threaded tang, allegedly a solidly welded-on piece of high quality steel. This was certainly useful in straightening the sword and will be useful in the future when the hilt will have to be repaired or the blade be replaced. It does, however, come with the downside that the hilt assembly is not 100% locked in place. The handle can be twisted slightly (the wood most likely deformed after being fitted to the tang) and frequently creaks, but it was easy enough to get used to that so it no longer bothers me. I would still opt for a peened construction were I to have it made again. 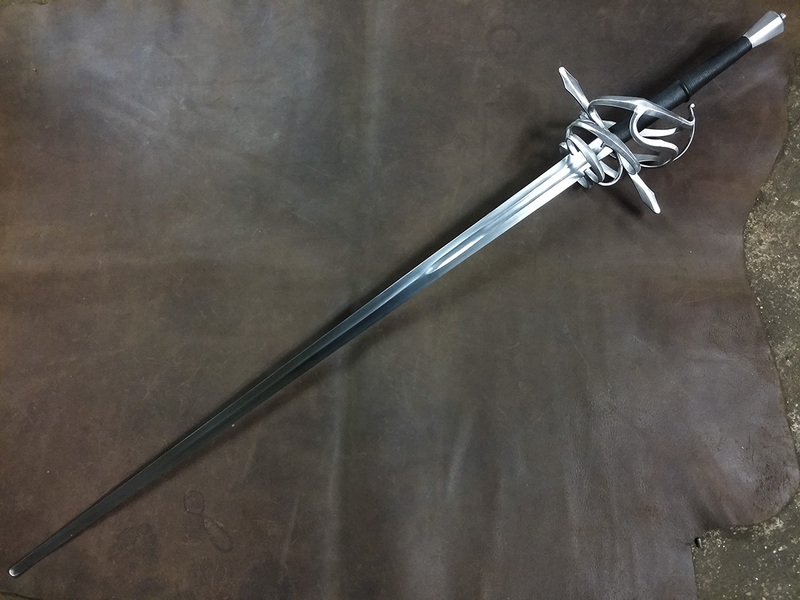 The last thing that needs to be pointed out in regards to the hilt is that while the bars themselves are very sturdy and don't bend at all, the welds connecting the edge-aligned finger rings to the crossguard broke after a couple of bouts. The sword is still completely usable, as compression and the outer rings still hold everything in place, but it's something that will eventually need fixing. To put this in perspective it must be said that the club I train with is rather rough on equipment when sparring. The force of impacts versus the forward rings combined with the considerable vibration the hilt has to withstand were simply too much for those two welds. The steels chosen have good corrosion resistance. I don't keep my training equipment in pristine condition (where it is not a safety issue) and sometimes slack off on keeping them oiled, so some superficial staining is to be expected. The blade is hollow ground, with a beautiful fuller running from inside the crossguard throughout the forte of the blade. The middle of the blade is of a hollow-ground diamond cross-section and the foible is left flat. Distal taper is very nice as well, going from 6-8mm at the base (difficult to measure) to 2mm at the foible, with the very tip returning to the blade's stock thickness. The central ridge of the blade veers noticeably off-center on one side towards the foible, but I actually appreciate the irregularity as a sign of it being a hand-fitted one-off piece. As is to be expected from a 142cm sword with a complex hilt, it's not a whippy lightweight Feder. Its 1870g are, however, well distributed. The blade has a considerably greater presence than my other swords and Feders, allowing for stable binds and blows with authority. It's not awfully slow, despite its mass, and comparing to the closest thing to a proper longsword I've handled (Albion Munich) it is a much closer approximation than a Feder or many of the other simulators I've tried. The protective finger-rings allow for considerably improved control by using the right hand in a rapier-grip with the index finger wrapped around the cross. This, combined with the lateral bars of the hilt, does restrict the hand's ability to quickly switch between gripping techniques. 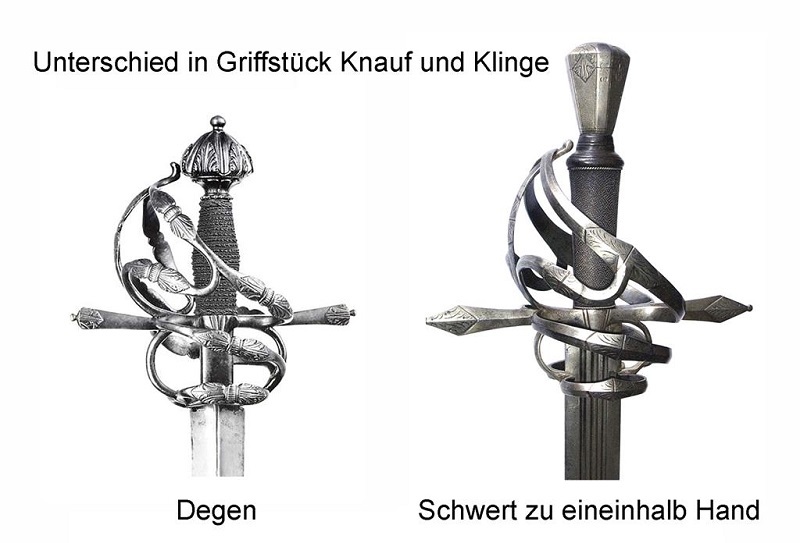 An Ochs or Pflug with the thumb on the side and the true edge inverted (as it is taught in my school) is unergonomical to impossible with the hilt, but since one of the primary benefits to those grips is improved hand protection I consider them to be redundant in this case anyway. It has been very interesting not only to passively benefit from the added hand protection, but also consciously use it to my advantage, allowing me to safely execute maneuvers that would usually get me hit in the hand. Hand protection is very good, aside from the odd thrust to the hands nothing has yet slipped through the bars. Good thing, too, as the hilt, while spacious, is still too tight a fit for my lacrosse gloves, leading to me using only a padded leather glove on my right hand. Were I to slightly modify my lacrosse gloves (mostly by removing the padding over the web of the hand between thumb and index finger) I might get it to fit properly inside the hilt. There are mainly two issues I had when handling the sword, one of which I have been able to work around myself. The combination of the rather narrow and smooth pommel with the rather smooth and slippery leather did not provide enough traction for my left hand in the long run. I resorted to applying overgrip tape for tennis rackets to the lower half of the handle and the pommel and have not had an issue with it since. It looks funny with its pink overgrip, but it's a joy to fence with now. The other gripe I have is the blade's flexibility. While the forte is nice and rigid, the middle and especially the flat section of the blade have a bit too much give for my tastes. I would have liked it better if it were as stiff as my Regenyei Feder (stiff version), and should I ever have to replace the blade I'm going to ask if that would be a possibility. Overall I really like this sword. While it's not perfect, it's still a blast to use, and having gotten used to most of its little quirks I feel extremely comfortable using it. It's also still an absolute eye-catcher and will most likely remain my go-to longsword for years to come. Beautiful sword! We don't see many of these. Interesting to see a complex hilt on a longsword.